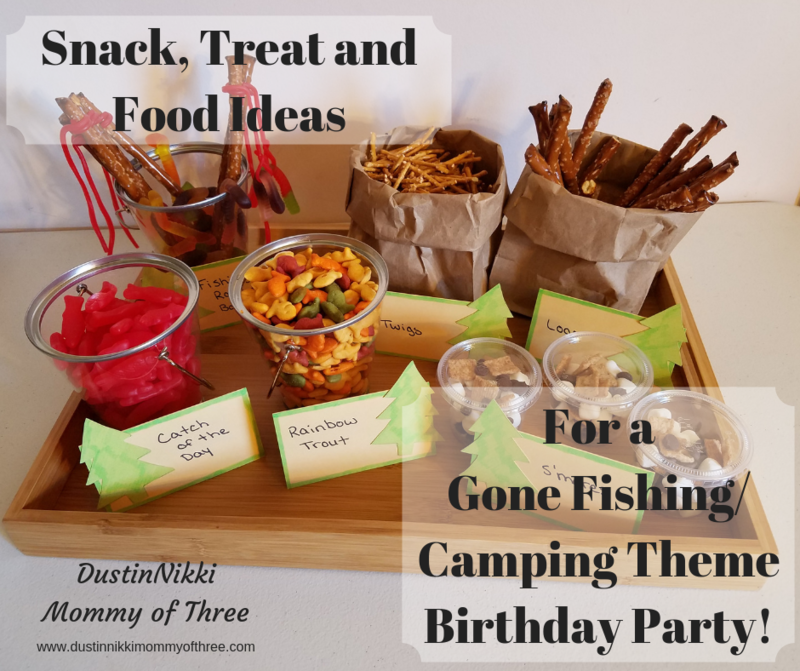 Need some snack or treat ideas for a Gone Fishing/Camping Themed Birthday Party? 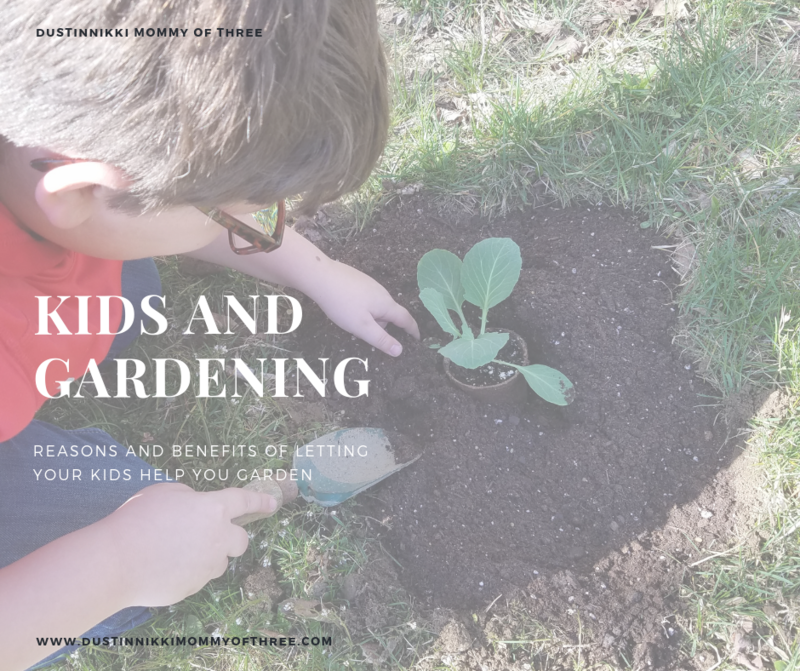 In this post, you will find some ideas that you might like. 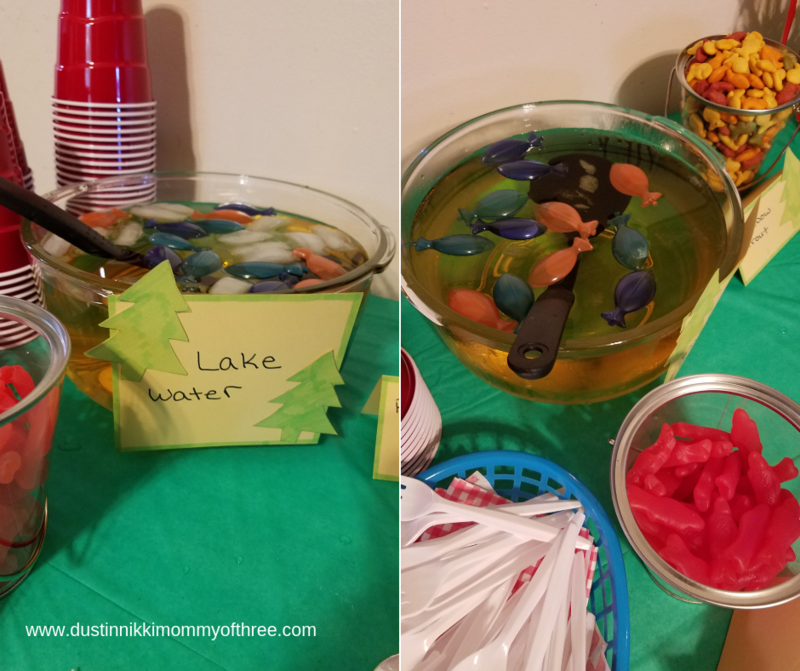 These are the snack and treats that we had for our youngest son’s birthday party we just had not too long ago. I also made a campfire cake for him too. 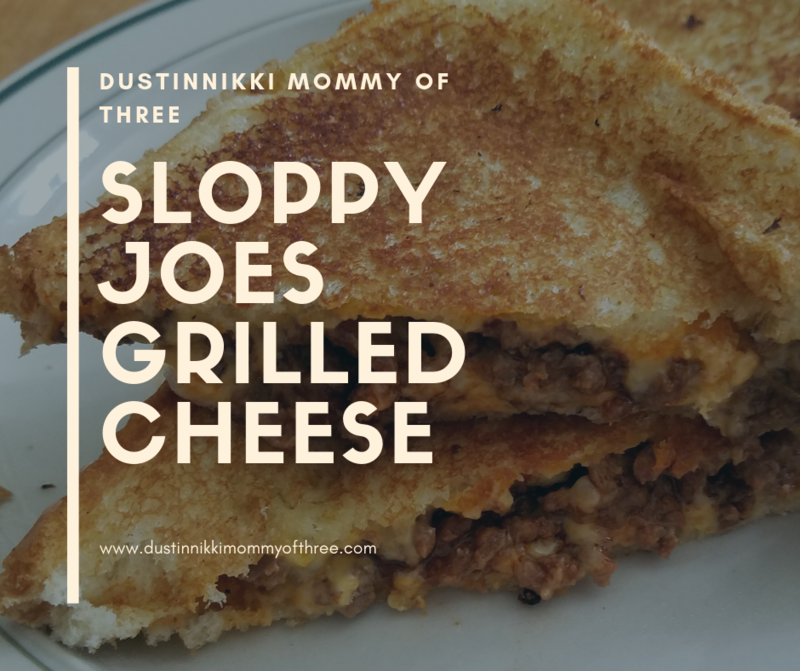 If you want to see how I made it or see how I made snack/food tent cards, check out the links at the bottom of this post. These cup are super easy to make. 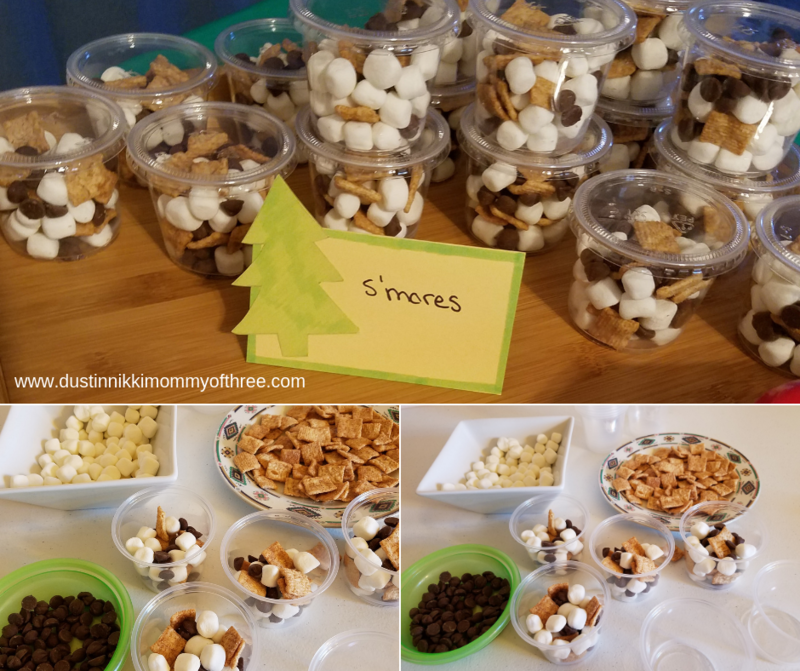 All you need is some mini marshmallows, chocolate chip morsels, and cinnamon toast crunch cereal. I was going to just break up some graham crackers but the cereal was easier. And it meant I could have a bowl of cereal later. These are really simple obviously. 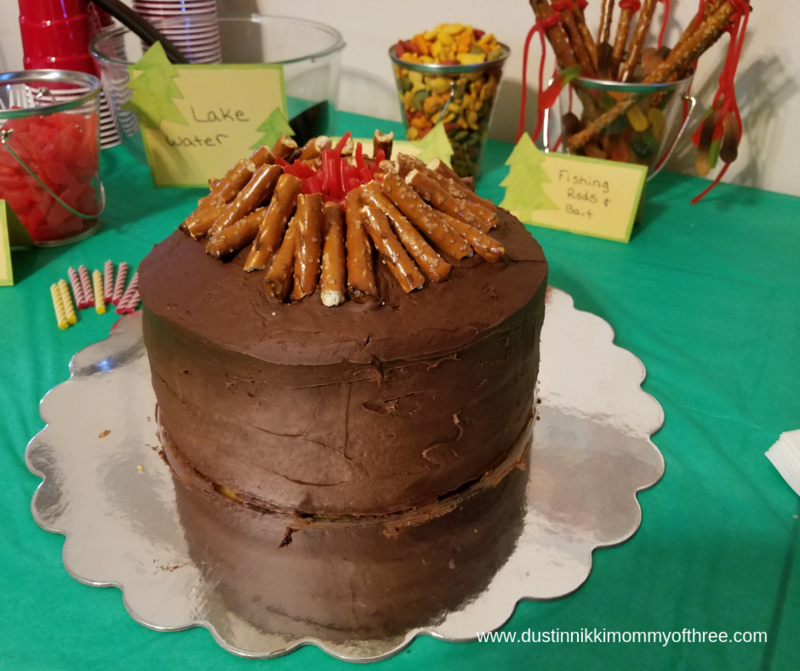 I had some extra pretzel rods after making the cake and making Pretzel Rod Fishing Poles (see further down). I thought it would be a cute idea to use rolled down paper bags instead of bowls to serve them in. These are also pretty simple. 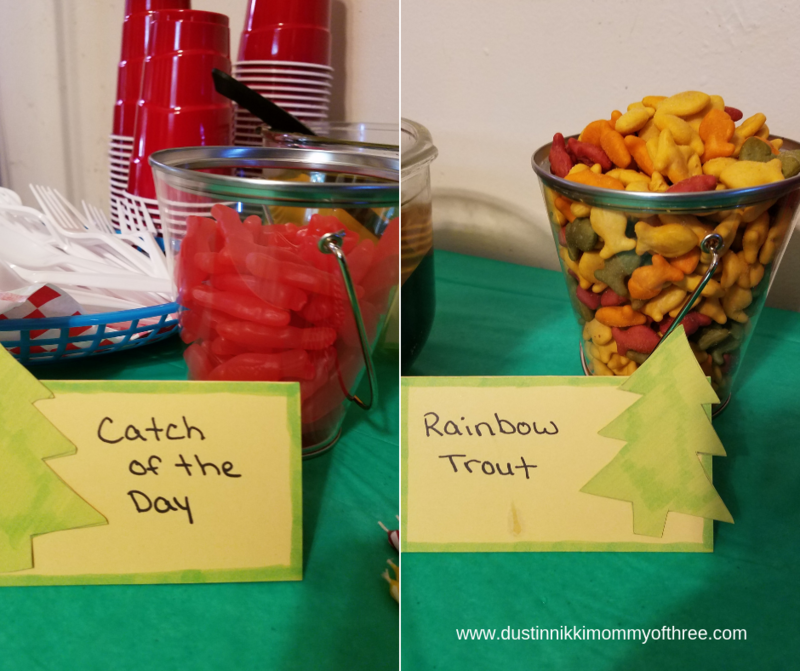 They were dubbed “Catch of the day” and “Rainbow Trout”. Cute huh? I bought the clear buckets a while back to use for another party (my older son’s Minecraft party) and kept them to use again. I found these buckets at Walmart at the time for less than a dollar each. I used pretzel rods, pull apart Twizzlers and gummy worms for this one. They were really easy to make but I did have a little difficulty with them. 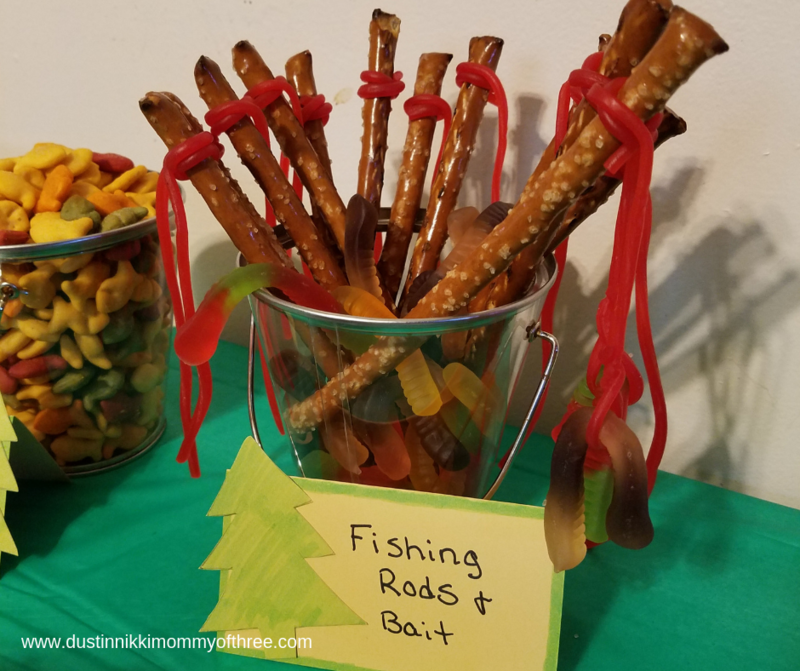 If you check out my Pretzel Rod Fishing Poles post, you will see why. The link is at the bottom of this post if you want more details on how to make them. I loved them though, the kids thought they were pretty cool! I meant to put out Lake Water in my glass drink dispenser but it broke on me. So I improvised and used a punch bowl and ladle instead. It’s not really lake water. It’s apple juice! You wouldn’t really think I would serve actual lake water right? I happened to have some of those re-usable ice cubes shaped like fish so I thought it was a cute touch. Last but not least was the cake. I decorated it to look like a campfire. It was actually one of the easiest (probably was the easiest) cake I have ever done. It looked really cool when we lit the candles on top because it really did kind of look like there was a bonfire on top of the cake. 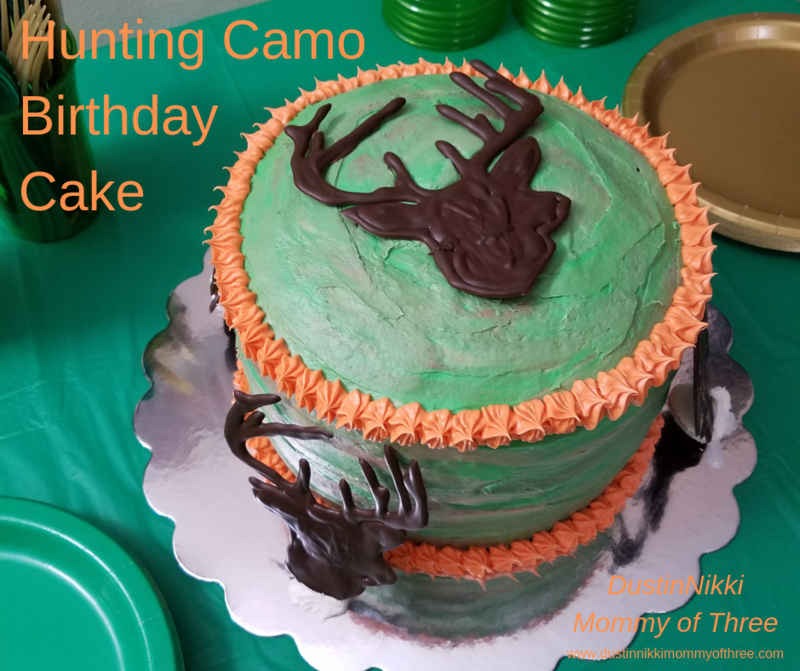 For more details, check out my cake post. The link is at the bottom of this post. 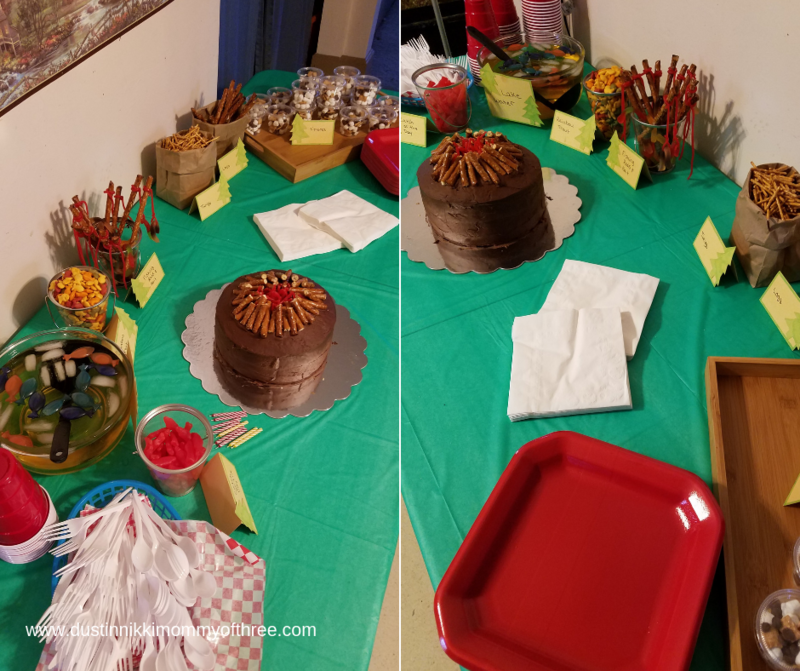 Everyone loved the table and the snack/treat ideas. If you are looking for inspiration, I hope this helps! 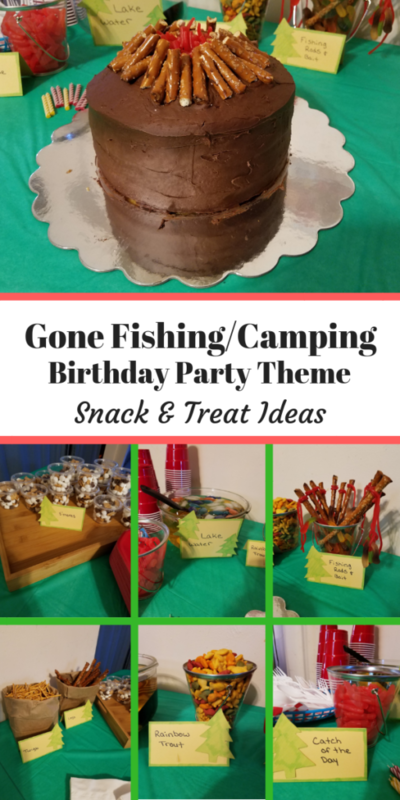 See the links below for other Gone Fishing/Camping Theme Party posts. 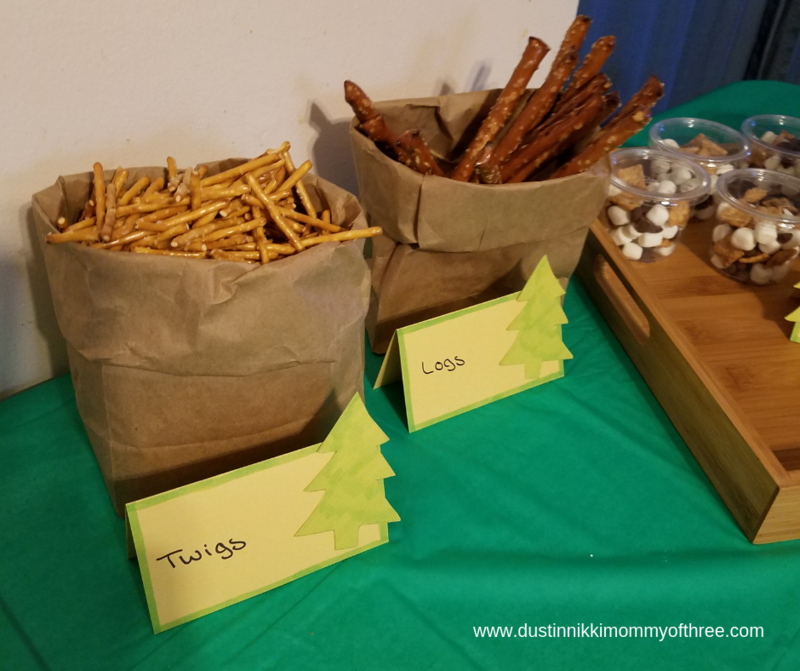 You can see how I made my tent cards, birthday cake, and the pretzel rod fishing poles!